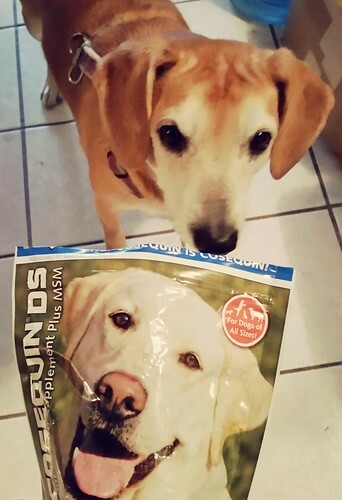 A few weeks ago we told you Sophie was starting a 30 Day Nutramax Cosequin Challenge with our friends at Chewy. Well, here we are for our mid-way check in... and I'm pleased to report that Sophie is doing well and loves her Nutramax Cosequin DS plus MSM Soft Chews! Sophie has been taking Cosequin daily and has no idea that it's really "medicine." She seems to know the Cosequin bag is her special bag of treats and actually seems to flaunt it to her brother and sister as if to say "these are mine... all mine... ha ha ha." 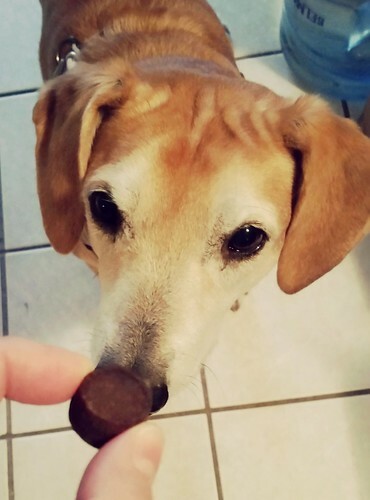 Sophie's "special treats" play an important role in maintaining optimal joint function, and at 9 years old it seemed like a perfect time to get her started. Cosequin helps support cartilage production and protect existing cartilage from breakdown - important issues to watch for in senior dogs. 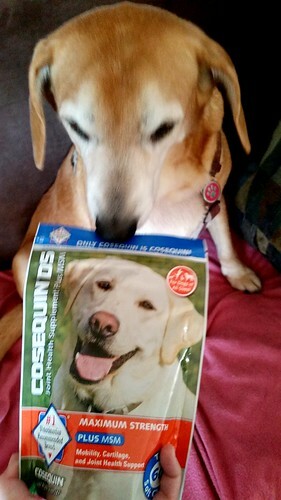 I love the fact that Cosequin DS plus MSM Soft Chews provide a perfect combination of ingredients to keep my dog healthy. Instead of having to give 3 or 4 separate pills, Cosequin packs them all into one bite sized morsel. I also love the fact that Cosequin soft chews are so easy and convenient to give to Sophie - and that she likes them! My old girl is the only dog I've met who will spit out those heartworm preventative "tasty" chews. If we're not careful, she'll even separate her new heartworm medicine from the peanut butter we pack it in.... gobbling up all the tasty peanut butter and spitting out the tablet. But the Cosequin soft chews are gone before you can say "taste it!" Sophie clearly is loving this 30 day challenge and I can't thank our friends at Chewy enough for putting us on it! It was the extra push I needed as a Dog Mom to get my senior girl started on a joint supplement! We'll check back for our final report in another couple of weeks, but in the meantime you can order Cosequin soft chews and other products at Chewy. They carry several options for both dogs and cats. Remember, 1-2 day shipping is always free on orders of $49 or more! Joints on Harley are fine, it's these allergies he's battling with right now. Never realized there could be a problem adjusting to the warmer climate. #whoknew? Merry Christmas my friend! I am so glad that these "treats" seem to be helping Sophie. It's hard to see our babies have trouble getting up and down. And getting her own special treat is just the icing on the cake!